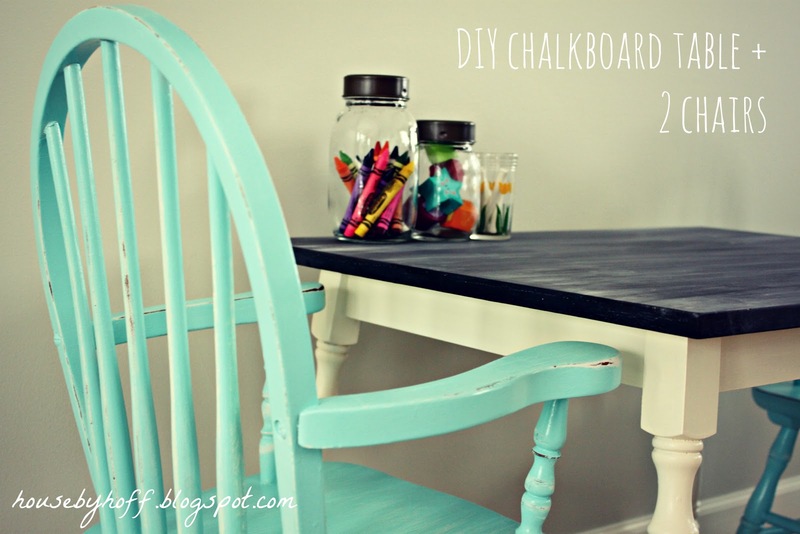 It’s $30 Thursday, and I’m excited to share my DIY Chalkboard Table + 2 Shabby Chairs! The story of this little table and chairs begins months ago. I found them at a garage sale last summer . I knew that Miss L. would get a lot of mileage from this little table and chair set! Like many of my thrifty finds, this little table and chairs sat in our basement for a few months. 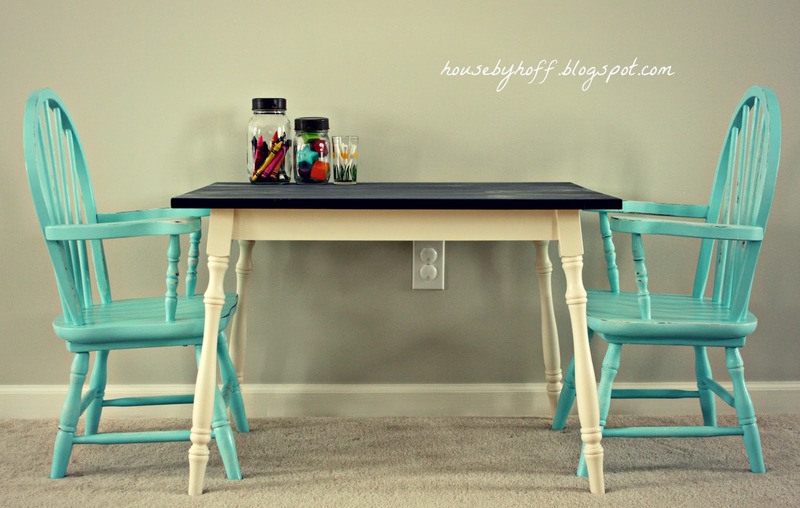 Then I saw this great tutorial from Houzz.com about making a chalkboard table top. As the article points out, chalkboard table tops are durable, wipable, and very kid-friendly. I knew it would be the perfect fit for my little garage sale treasure! The table was an easy fix! First, I sanded and primed the whole thing. Then, I painted the base with American Accents “Heirloom White” The top got two coats of Rust-Oleum’s Chalkboard Paint in “Black Finish”. I used a brush for both the base and table top. *Note* I keep both American Accents “Heirloom White” and Rust-Oleum’s Chalkboard Paint in “Black Finish” in my paint supply at all times. I do quite a bit of furniture painting, and I want the whites to all match! As soon as the spray paint dried, I roughed up these little chairs with a medium grit sand paper. I sanded harder in places that I wanted the wood to come through, and lighter in places to let some of the white primer show. I’m deeelighted with how this little project turned out! And so is Miss L! 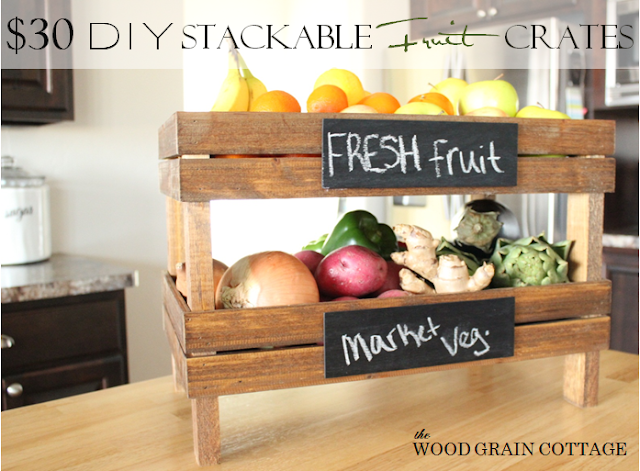 To see Shayna’s project, DIY Stackable Fruit Crates, click on over to The Wood Grain Cottage. 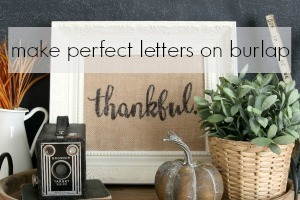 Shayna and I are starting a $30 Thursday Pinterest Board to keep our projects in one place for all to see! 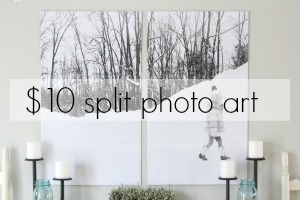 Click the link to start following our thrifty projects! Previous Post: « Is It Spring Yet? Love that stackable fruit/veggie crate!! adorable! 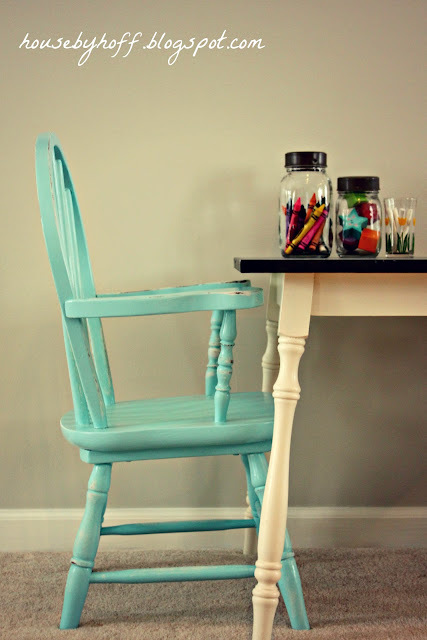 i need to makeover my little girl’s table and the chalkboard top is such a great idea! Wow, that looks SO great!!! Love your transformation! I know my little guys would love a table like this. Thanks for sharing! Both of these projects couldn’t be cuter! 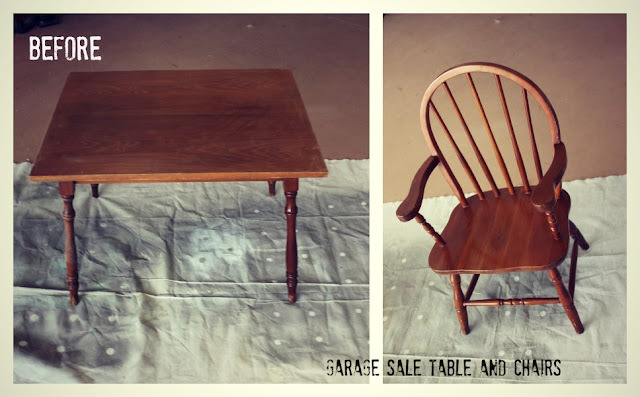 What a great garage sale find on the table and chairs – adorable! That turned out great! 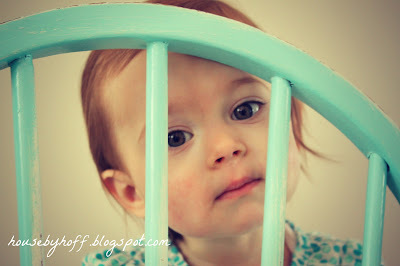 I think it would be a great idea for our playroom table that is in need of a new paint job! Absolutely love this! You did a great job! What a find on the table and chairs too!! 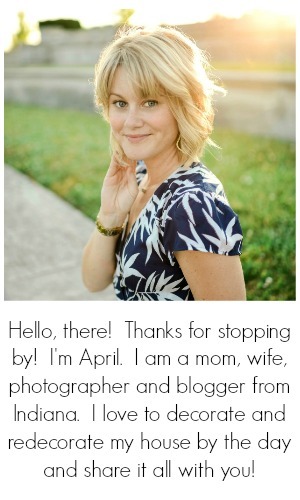 New follower ~ would love to have you check out my site too! This is so cute, and so functional! What great colors you used!! It’s been pinned! Have a wonderful weekend! P.S. what a darling little girl! Your little miss will enjoy this for years. You chose two of my favorite go-to colors: heirloom white and ocean breeze. Love the distressed touches. Looks gorgeous! Great job, April! Excited that you’re teaming up with Shayna – sounds like a fun series! LOVE these! 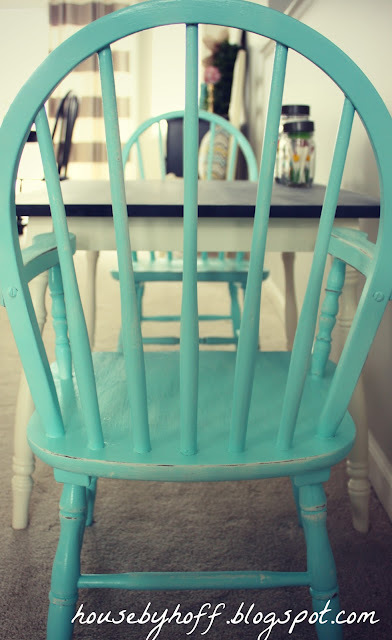 I’ve been thinking about doing something similar to our kitchen table and chairs because they’re really getting roughed up! 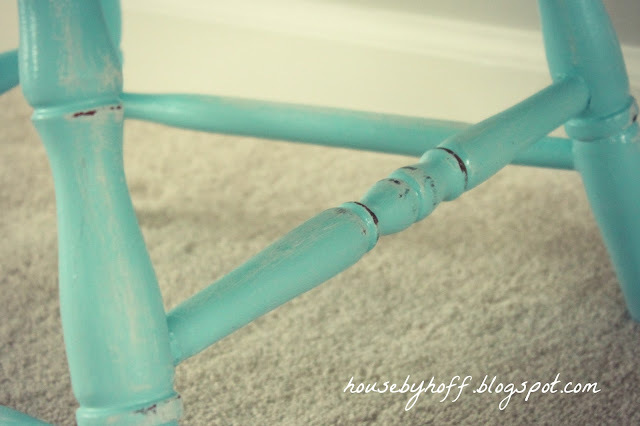 It’s amazing how fast furniture gets scuffed and ragged with a toddler! I love the color you chose for the chairs. I am on a no-spending kick for 2013 – not a resolution – just trying to use up what I have. It feels good to make/redo things without spending money. And, I ‘m cleaning up the cupboards as I use up what I have. Love, love, love both projects…amazing job! So cute!! I’m sharing this on my FB page and Google. Love the new series and can’t wait to see more!